New! Tormek T2 Pro Kitchen Knife Sharpener! New! Professional Kitchen Knife Sharpening from Tormek! 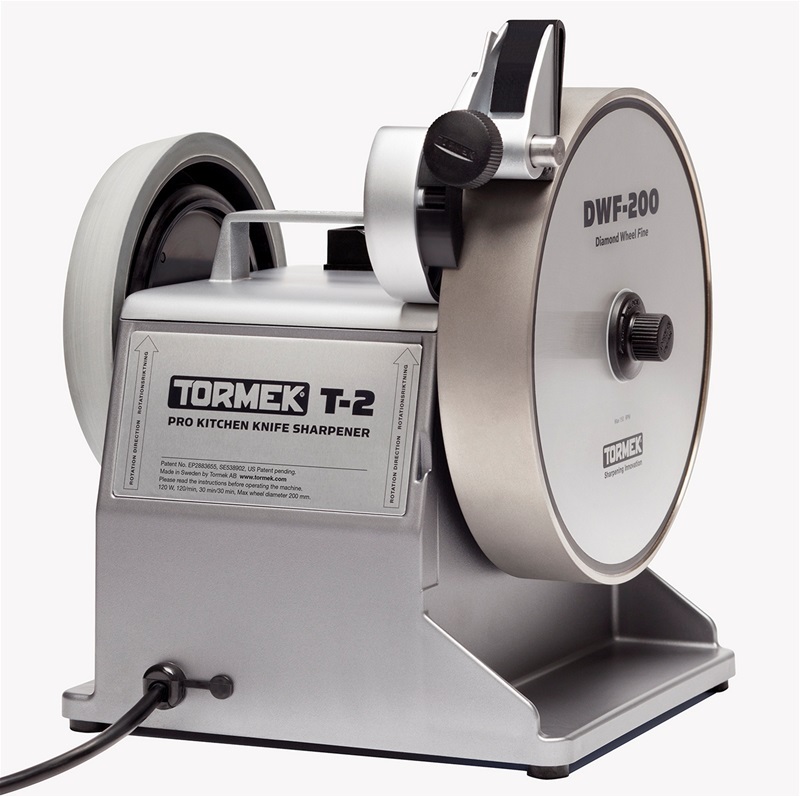 We're thrilled to introduce Tormek's newest machine, the T2 Professional Kitchen Knife Sharpener. Previously only found in Europe, now available in North America as well. And you'll only find it at Sharpening Supplies. The Tormek T2 Knife Sharpener is designed to meet the professional kitchen's need for efficient workflow and effective sharpening. The diamond wheel optimized for knife sharpening combined with an adjustable angle guide makes it easy to achieve professional quality sharpening, right where and when it is needed. Professional kitchens demand the best ingredients and tools. Why compromise on sharpening? The T2 has the adjustability and accuracy you expect from Tormek, without separate jigs. The Angle Guide is easy to mount to the Guide Bar and can be quickly set for angles of 8 - 22 degrees. Position a knife in the guide and lower it onto the moving wheel. Slide the blade evenly over the diamond grinding wheel with light pressure. Follow the shape of the knife to maintain contact. If you are sharpening to the same angle as the knife had previously, only a few swipes are required on each side. The T2 can accommodate knives 14 - 60 mm (5/16" - 2-3/8") wide, and up to 3.5 mm (3/32") thick and it includes a removable magnet for capturing swarf. Tormek is known for their water-cooled grinders, but the T2 is used dry. No water to splash around. The slow speed ensures that your steel will not over heat. The wheel itself can be cleaned with soapy water and a nylon brush as needed. In another innovation that streamlines use, the Honing Wheel on the T2 is a composite material with the polishing abrasive right in it. No need to load the wheel with honing compound. For those that understand quality and versatility, there is no substitute to Tormek quality. The T2 has a 7 year manufacturer’s warranty that shows Tormek's long term commitment to quality. By purchasing a Tormek you are making a long term commitment to sharp tools and knives, and Tormek will be there to back it up. Buying a Tormek is a safe investment in quality and performance. Made in Sweden.